Fortunately, this same idea can be adopted by many system owners and end-users when faced with the question of whether or not to upgrade their building automation controls. Ironically, one thing that has been consistent with the state of technology is its ever changing and evolving dynamic. With Building Automation Systems (BAS), this continuous technological evolution results in eventual product life-cycles for any BAS and its accompanying hardware components. New products introduce progressive stages of enhanced system features and capabilities, while legacy products succumb to digressive stages of availability, product support, and functionality. Industry analytics estimate building controls systems to have a 7-10 year life-cycle on average 1, eventually resulting with BAS products reaching end-of-life (EOL). 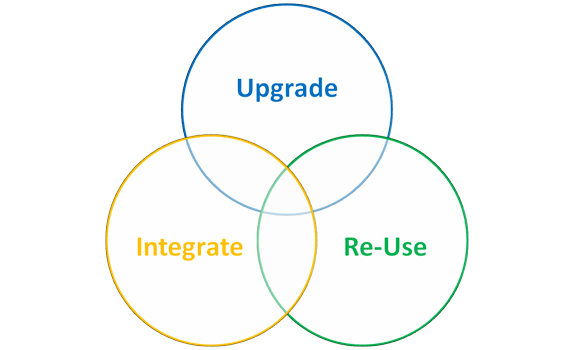 During a BAS end-of-life stage, a facility operation will typically adopt a hybrid approach by utilizing a combination of three options as they transition to new products: Upgrade, Re-Use, and Integrate 2. 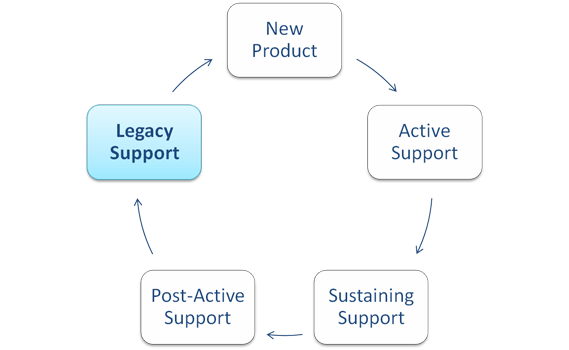 Additionally, before announcing EOL a manufacturer may offer options such as Last-Time-Buy (LTB) as a chance to stock up on spare legacy components before a product is discontinued in order to ease a customer’s transition to new technology 3. While new BAS technology provides values such as more open connectivity, increased energy efficiency, and advanced program intelligence, building equipment owners must balance these values with factors such as budget restraints, facility down-time, and life-cycle cost analysis. This calls for a more integrated and staggered approach to the upgrade process by maintaining both old and new hardware running simultaneously. Even so, with aging equipment comes potential issues such as glitches, decrease in component and parts availability, support, serviceability, and connectivity 4. ASSET Technologies, LLC effectively resolves these issues by developing comprehensive programs specifically designed to continue support for legacy building automation controls and BAS hardware components. Established in 2008, the company has taken this idea of incorporating an additional layer of product support to a whole new level, going beyond the basic “band-aid” reactive approach to EOL. Its repair solutions program includes complete re-warranty and recertification of EOL or discontinued BAS control modules, sustainable parts inventory, and technical support. This program has been adopted by over 25,000 building operations worldwide- including major retail chains, hotels, school systems, hospitals and government/municipal facilities- as a way to continue maintaining existing BAS equipment, and stretch the life-cycle of legacy hardware components. This has resulted in benefits such as budget savings and increased ease of transition from old to new technology. ASSET Technologies currently supports legacy controls from major BAS manufacturers such as Novar, INNCOM, Johnson Controls, Barber Colman, and more. As most building owners and facility managers know, one of the keys to a successful facility BAS operation is planning closely with a systems original equipment manufacturer (OEM) 5. As an added value for customers who maintain legacy EOL system hardware, both Novar 6 and INNCOM by Honeywell are working exclusively with ASSET Technologies as the official and only authorized EOL support center for legacy products. As an OEM endorsed support program, ASSET Technologies has received full training and factory support to provide continued repair & warranty for faulty control modules, revolving inventory options for LTB stock, and technical support for legacy systems. This extended support has proven to be an invaluable opportunity for customers to continue utilizing the hybrid approach of maintaining existing equipment while smoothly transitioning to new OEM technology. As technology continues to evolve and legacy products continue to age, the transition from old to new hardware will always be a factor in the foreseeable future for decision makers in the building automation controls industry. While advances such as open network protocols, the rapidly relevant Internet Of Things (IoT), and new energy/environmental compliance policies 3 all point towards a bright future for the industry, opposing factors such as facility budget restraints, economical & operational limitations, and even increasing demand for companies green initiatives to re-use and recycle 7 all move to pace this growth. ASSET Technologies solutions for legacy product support sets a precedence to match this transition by connecting the divide between old and new. So, when faced with whether or not to upgrade building controls, they echo Mr. Stark's response by asking the same question “Is it too much to ask for both?” And the answer is: Absolutely not!